Plus, Wanderer class trailer also released. 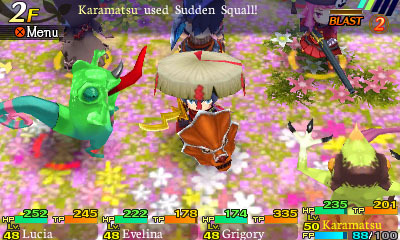 The April 7 North American release of Etrian Mystery Dungeon will be followed with a month of free downloadable content, Atlus announced. The content will be free until May 5, before reverting to paid downloadable content (prices indicated below). In addition to the free downloadable content, a paid 3DS Etrian Mystery Dungeon theme will be released on March 31 for $0.99. Watch a new trailer for the Wanderer class below, as well as a look at the paid 3DS theme. View a new set of screenshots at the gallery. Like to roam around around around around? Well then they should call you the Wanderer! Someone who never sheaths their sword and keeps ferrets and/or any other small animal friends hidden at all times. They’ve found that through being defeated over, and over, and over again, that survival is an absolute must. Thanks to expert studies at the school of hard knocks, they’ve learned to make their own escape route, because losing all your items in the mystery dungeons is akin to losing a part of your soul. By the way, if you see the Wanderer with their bamboo hat tilted downward, don’t be confused. Wanderers just aren’t huge fans of talking. Maybe this is because they don’t have much to say. Or maybe they think that for some reason their ferret will do the talking for them. But you know what they ARE huge fans of? Clearing hidden paths and using skills targeted towards insects, plants, animals, and even dragons, that’s what! Oh, and rice balls. They’re fans of rice balls too.